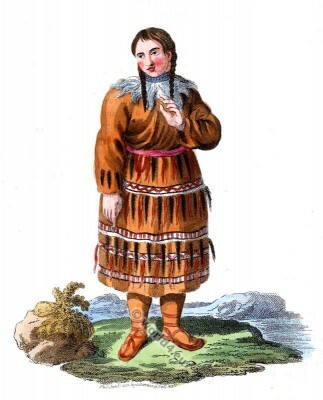 A Woman of Kamtschatka in her richest Apparel. Home » A Woman of Kamtschatka in her richest Apparel. A Woman of Kamschatka in her richest Apparel. Une Kamtchadale dans sa plus grande Parure. But, notwithstanding the difficulties mentioned in the preceding description, the lover has not yet passed through all the formalities necessary to secure him the title of husband: for in Kamschatka, by a singular custom, the marriage is not celebrated till after its consummation. The husband returns, in a few days, to the bride’s parents, and the nuptials there take place. He is attended on the road by both their relations. At a short distance from the habitation the company stop, and the festival commences with songs suited to the occasion. These songs are accompanied with various religious, or rather superstitious ceremonies. Drum-sticks are interwoven with garlands, made of an herb which they hold in great veneration, and to which they at-tribute the most efficacious qualities; a few words of a mystical signification are muttered over a dried fish’s head enveloped in the same herb, and the sacred charge is entrusted to the care of an old woman. To the clothes which the bride has already on, are added a jacket of sheep’s-skin, and four other garments, which are thrown one over the other. Arrived at the hut, she does not descend into it by the usual ladder, but is let down by means of bands placed under her arms. The old woman to whom the fish’s head was confided, places it at the foot of the ladder. The bride and bridegroom trample upon it, each of the company hasten to follow their example, and the old woman, who had hitherto preserved her charge with the utmost care, is contented with being the last to commit this outrage: she afterwards picks up the mysterious head and places it over the fire. This strange ceremony is, doubtless, allegorical; but, hitherto, no traveller has given us a satisfactory explanation. After this, the bride takes off the four additional garments, and distributes them among her relations, who, in return, present her with various presents. The company then sit down: the religious rites are concluded, and the rest of the day is devoted to festivity. The new married pair remain for some time with the bride’s father, and their labours are devoted to his service. Polygamy is allowed in Kamchatka; but, as the husband is under the controul of his wife, he rarely takes more than one. Marriage is only for-bidden between fathers and children, brothers and sisters, Divorce is common among them, and is attended with no ceremony whatever. This entry was posted in 1803, 19th Century, Asia, Kamtschatka, Russia and tagged Edward Harding, Russian national costumes, Traditional Kamtschatka dress on 11/3/14 by world4.